This post is in three parts. The Swim (here) The Bike (here) and The Run (here). We woke up at 4:10 and I ate a breakfast of 4 fried eggs, 4 pieces of bread, some olive oil on top to make things slimey, and a full tub of yogurt. I also had a few pieces of cheese as well as a banana and a kiwi fruit. I had been out of bed to pee three times during the night (overenthusiastic hydration strategy along with the great pork tenderloin for dinner the night before) and so I didn’t drink much the morning of besides a glass of milk. We were on the road close to 5am and arrived into Penticton with plenty of time. The special needs bags were deposited where they needed to be deposited and we stood in the line-up to get body-marked and did some people-watching. I then sauntered over to my bike, pumped up the tyres and added my two bottles of fluid and then sought out a toilet. There were about a thousand people in line (no joke!) and so I left the transition compound and found the toilets that were ready for the post-race crowds, and had no line whatsoever. I then found Mom through the fence, soon saw Dad through the fence and then headed in to put on the wetsuit and eat my pre-race banana (a four year tradition, it hasn’t failed me yet!). 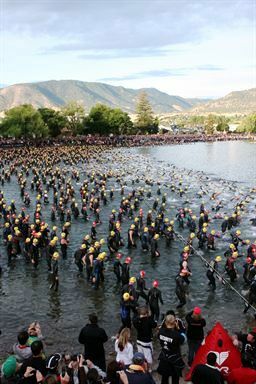 I watched over the fence as the pro start took to the water and then joined the crowd of people flowing out of the transition zone onto the beach. 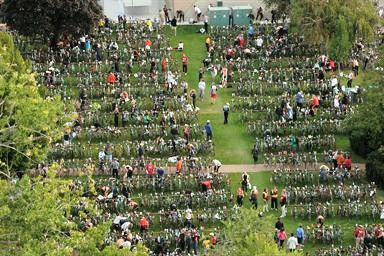 2800 people. Wow. It was only at that point that I found my brother, camera in hand, in the swim corral snapping shots left right and center while people put their caps on, zipped up eachothers wetsuits and talked about how much colder the lake was this morning than a few days ago prior to all the crazy wind that had been causing white-caps on the water by late afternoon each day since Thursday. I thought the water was plenty warm for swimming and wasn’t put off at all swimming with a sleeveless suit but I still skipped a swim-warmup opting instead for just shoulder circles with dry arms. Getting all wet and then standing around with wet arms and head and no wetsuit to keep the chill off would have been chilly. I made my way to the front and everyone was pretty happy to let me past them. I thought I might have to do some jockeying for position to get to the second row but because I was a bit left of center there wasn’t much to it. I just walked up, said hello to the people around me and promised the girl in front of me that I wouldn’t swim over her so long as she kicked hard and made a good draft. She just gave me a nervous smile, and it was at about that point that I realized that I was awfully calm considering the situation with a few dozen people poised to swim directly over me! Too late to get nervous now, I sang the national anthem at full blast along with a few thousand people and then the countdown was on. The horn went and I was off like a rocket. No hesitation like GWN that had cost me a couple people dashing by and congesting my start significantly. I was off and away swimming hard and finding very little in the way of shoulder bumping let alone the full on arm-wrestling that I’ve experienced before in much much smaller swim starts. I settled after what I figured was about 200m and set out to start lining myself up for a draft rather than just relying on the general draft of the crowd ahead of me. I was sighting for a bit and then noted two things. 1) I am good at swimming in a straight line so I was never really thinking I needed to make a correction. 2) There was absolutely nothing I could do about altering my direction without getting hammered by people swimming over me even if we were going off course. I stopped sighting regularly at this point and just swam, telling myself to keep the gas on, but don’t go hard. I could tell when we were nearing another buoy each time as the crowd would squeeze slightly as the people way off to the left aimed in a bit more people on the right aimed in a bit more, it got tight each time but never too tight that anything got interrupted, just enough to thicken the crowd up and make the draft stronger and easier to follow. Wahoo, this swim was going so well! I decided to take a peek and looked up at one point, we were already surprisingly a mile into the swim as the first houseboat was right there. I was preparing for a little wrestling match to get around the corner but it never came and never came and never came. Then I saw a scuba diver under me and thought to myself “I’m likely never going to be back here” so I took the opportunity to coast for a second and wave at him. He waved back and I could feel a big smile spread across my face. 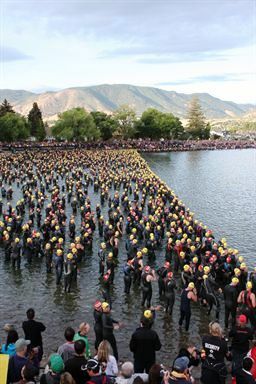 I’d read about waving to the scuba dudes under the houseboats out here in the lake even before I’d done my first triathlon. That was a long long time ago, it seemed, and today it was finally happening. It was a bit of an emotional experience. I was already a mile into this thing before I fully contemplated how big of a dream coming true this really was. This is a big deal, it’s been a really long time in the making, and I was so happy to be out there. Then, bam! I got hit in the head. Then again in the ribs, then again on the head, someone grabbed my leg and pulled it down, someone else swam sideways across my back, I have no idea where they were going. Okay, that wrestling match was starting. Everyone had gone into the corner nice and wide, the people on the far side all knew they were only going to wind up in a brawl if they took the corner tight so they didn’t swim straight at the boat. Unfortunately they didn’t swim far enough past the boat to keep the corner wide. We’d just merged probably 20 lanes of traffic into 12 lanes of traffic. I just tried to pull hard at the water, keep breathing and keep swimming and soon enough it was over. Off to the second houseboat we go! There was now no mountain to sight off in the background and those 12 lanes of traffic dispersed awfully quickly and I was swimming in clear water but right on track to maintain the straight line. I knew it was only 400m to the next turn and figured I’d just swim rather than go look for a draft. I knew where I was going and so I just went. Soon enough I found someone else again and hopped aboard their feet for a tow. Seeing the houseboat I got prepared for another melee but this was quick and off we were going back to shore, no punches at all. Then I saw a huge person. I’m not kidding, she was enormous but hey, she was swimming faster than me so far because she was still ahead of me at this point. I hopped into the draft and it was like swimming into vacuum cleaner. I went from “keep the gas on” to just coasting along. I don’t know how long it lasted nor do I know how I lost her draft but eventually I realized I was having to work harder to keep up, then I realized I wasn’t behind the whale wearing the blue helix wetsuit. Oh well. Then I met a friend with white and orange goggles. I don’t know his number or his name, nor did I talk with him before, during, or after, the swim, but I still felt like he was a friend. He was nice and we swam side by side for a long long time, we had the same rhythm and were going the same speed and drafting off of two people ahead of us swimming side by side. I was behind a guy with something written in green on the calf of his wetsuit and he was behind someone who had the whitest feet I’d ever seen in my life. I swam right there with those three people all the way back to the beach. My friend with white and orange goggles never once bumped or interrupted me but we swam shoulder to shoulder all the way back to the beach together. When I started to touch the bottom I stood up and heard Dad shouting my name. I waved in his direction as I stood up and stepped gingerly over the rocks on the sand-bar and then dove back in once we got back to deeper water. 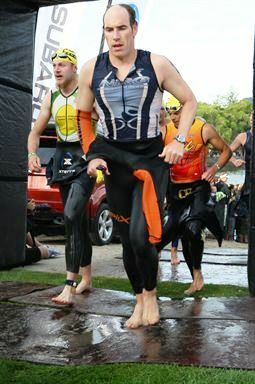 I swam past a bunch of people wading chest deep in the finish chute and got up into the finish chute. I got my wetsuit undone on the first try which always makes me feel really lucky and then off up the beach. I saw 1:05 on the clock and was completely ecstatic with my swim performance. I’ve got time in the bag, already ahead of schedule, and I hadn’t had to work hard at all to earn it. I had hoped to swim 68 minutes way back last year when I first contemplated how much improvement I could hope to expect to make on my swimming in one year. 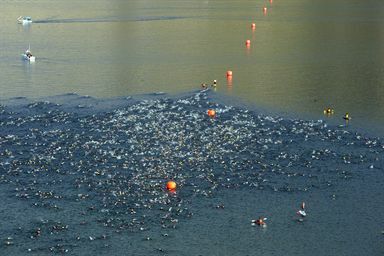 It was an ambitious goal, and even on race morning I was prepared to not be able to swim 68 minutes. 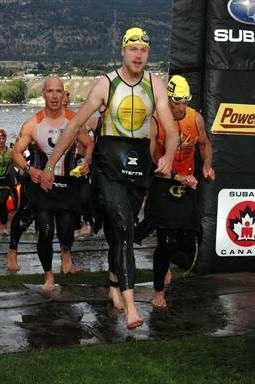 I had budgeted 10 minutes of “contingency” time into my race goal to take care of things like a flat tire or a need to stop for a washroom break or things that aren’t really “racing time”, and I was prepared to use some contingency time to make up for a swim that wasn’t as good as I’d hoped. I was mentally prepared to be a bit disappointed, so when I found out that I’d scored three minutes of “extra time” I was super happy. Percentage wise that’s the same as “accidentally” biking a full 15 minutes faster than anticipated or running 10 minutes faster, really it’s amazing. So despite the fact that “compared to the average” I was less good at the swim than I was at the other two legs I’m totally proud of the effort. I pointed at the tallest, burliest guy stripping wetsuits in the whole crowd of bodies and arms and wet grass and legs and neoprene there and got his attention as I ran through, hopped on my bum and he peeled it off in a flash and I was off. I ran directly to my swim bag, never hesitated, and was into the tent super quickly. I dumped my stuff on the ground and had my race belt on and was clipping up my helmet when a volunteer grabbed my wetsuit, I said thanks and was off jogging with my shoes in hand before I had even really realized what had happened. There were probably two hundred guys in that tent and just as I was leaving someone came in and cheered, then the whole place erupted in response. What an experience! I got sunscreen slathered on my arms in two seconds flat by a cute girl in a bikini and was off to find my bike. I opted not to run through here as at GWN I had hopped aboard my bike with what would become my maximum heart rate for that entire day. I didn’t want to spike my heart-rate so kept it to a jog. I got to the bike and wobbled a bit to get the shoes on. Whoa, steady… and then un-racked and hopped aboard. Let’s go for a bike ride!